TEA BENEFIT Oolong tea is used as an herbal brew for treating type 2 diabetic disorders and as an appendage to other supplementary drugs for treating the disease. It is well-known fact that tea drinkers have lower risk of acquiring skin cancer. Moreover, Oolong tea, contains compounds known as polyphenols. This polyphenol extract also acts a chemo-preventive instrument against development of other cancerous forms. DESCRIPTION Shaped like a small rosette, which blossoms on addition of water, as you sip. Pour water over the Peony and watch the magic in your cup. Do not brew in a pot. For multiple brewing keep adding water as you drink. 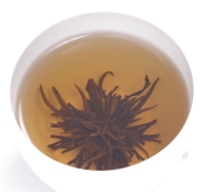 They are very light Oolong�s and have to be enjoyed without milk and sugar.